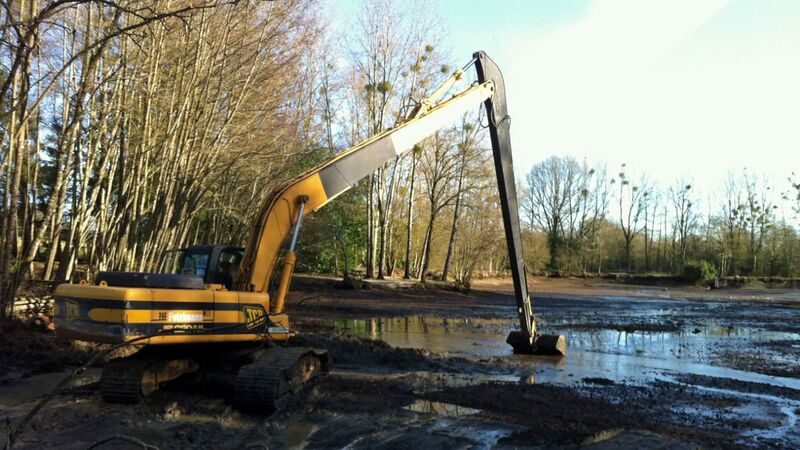 This winter it was all about improving the lake and water quality so we sent the excavators in to remove 3000 tons of silt! Every winter we make the most of the closed season and spend 5 months making improvements to the venue. This winter we undertook the largest program of work we ever intend to conduct. 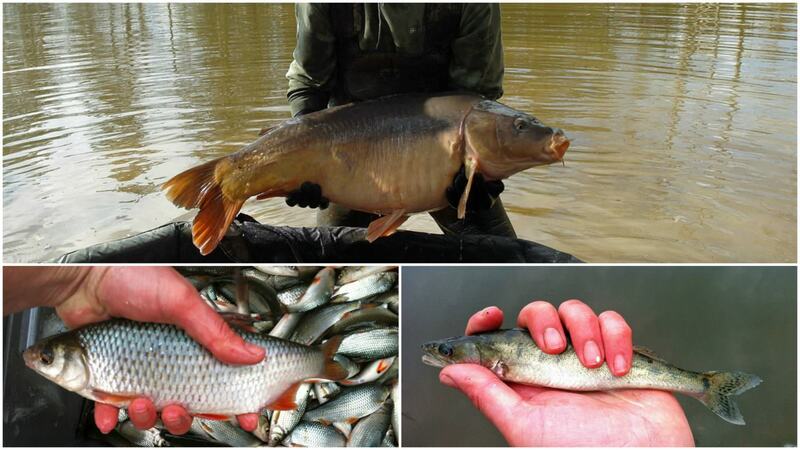 All lakes contain silt and a small amount of silt is part of the natural make up of a healthy fishery. 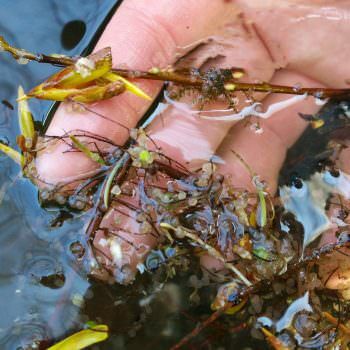 In 2013, during our first netting, we were advised by our fishery consultant that we had excessive levels of un-decomposed leaf matter and silt. and that in order to secure the future of the fishery we should remove some of it and treat what remains. Obviously this was not the kind of news we wanted to hear but it gave us a purpose and a direction in which to move. 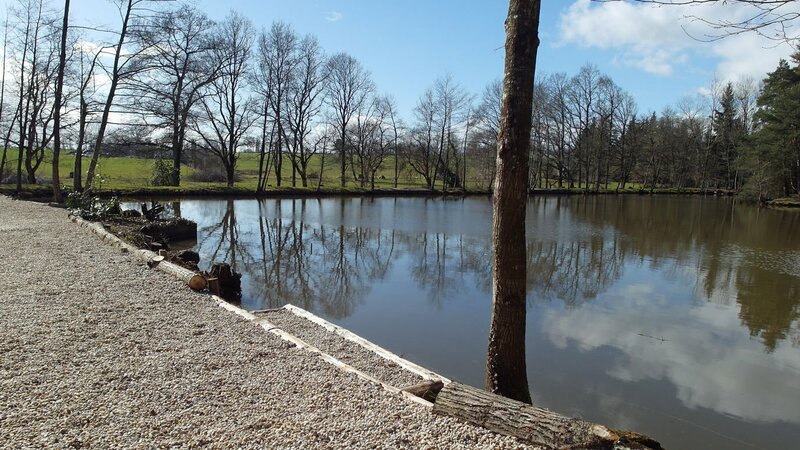 For us, owning Beausoleil was always a long term investment and our aim all along has been to make Beausoleil as great a fishing venue as it can be. The basis of any successful fishery is water quality and so we embarked on a long term program of work that will steadily improve water quality and therefore secure the long-term future of the lake. Poplar trees are the worst type of tree to have next to a lake as their leaves are large and take a very long time to decompose. 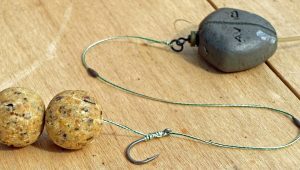 They also acidify the water which is the wrong way for a carp lake to be. And we have loads of them around the lake! 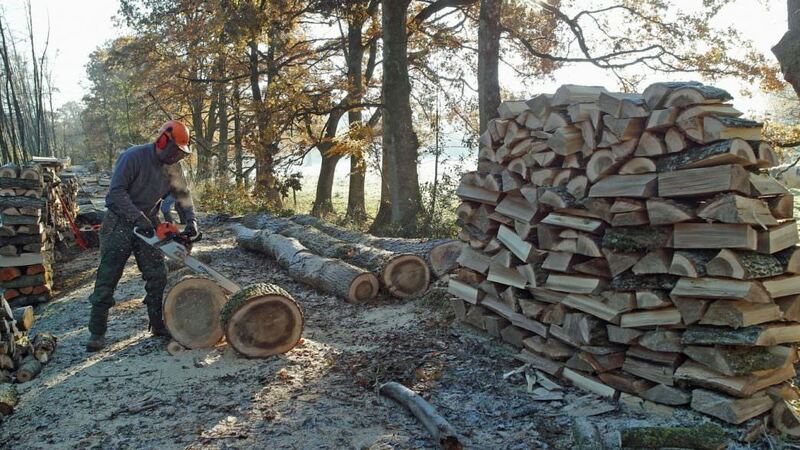 So in November 2013, we felled all of the poplar trees lining the main bank and made a lot of firewood! We then targeted the area known as the swamp. 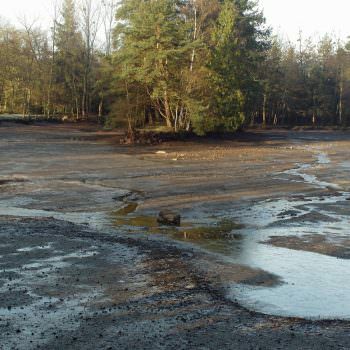 This nearly impenetrable forest of unmanaged woodland was to become the silt storage location. 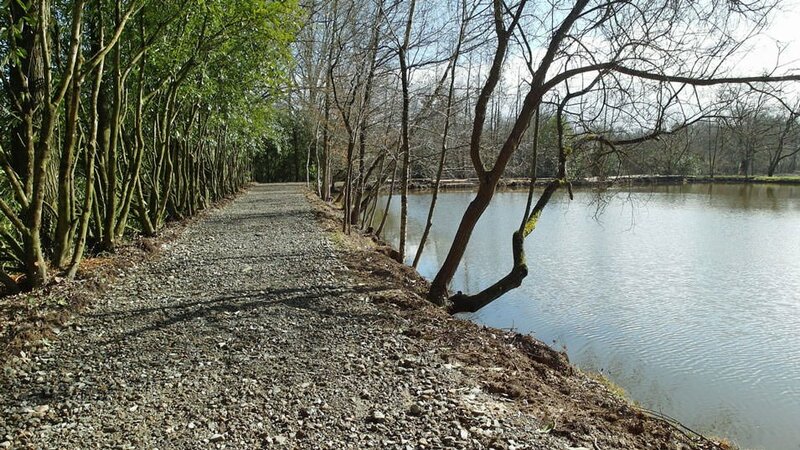 We built a retention bund lined with geotextile fabric with the trees that we felled. Only then could we start planning in more detail exactly how we were going to remove such massive quantities of silt from the lake. At the end of the 2014 fishing season, as soon as our last guests had left, we began to drain down the lake in preparation for a complete netting of the fishery. 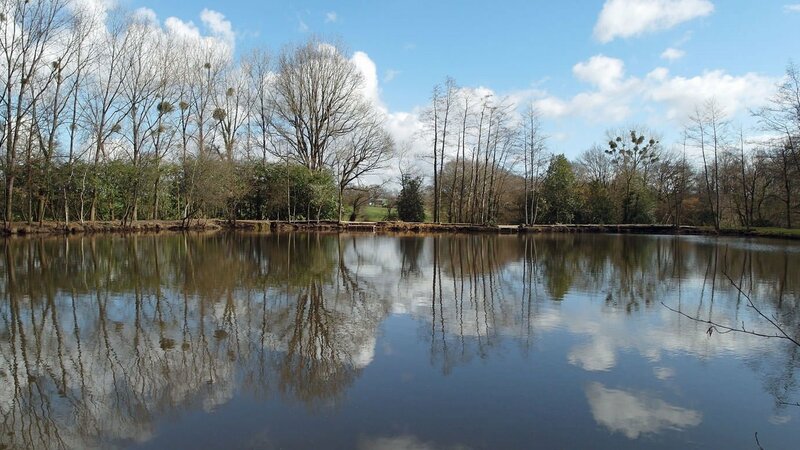 With the help of our fishery management consultant and fish farmer, we removed every last fish from the venue and accommodated them in their own private basin for a 3 month holiday. I visited the fish once a week to feed them a minimal diet of maize and pellet at a rate of just 10kg per week. 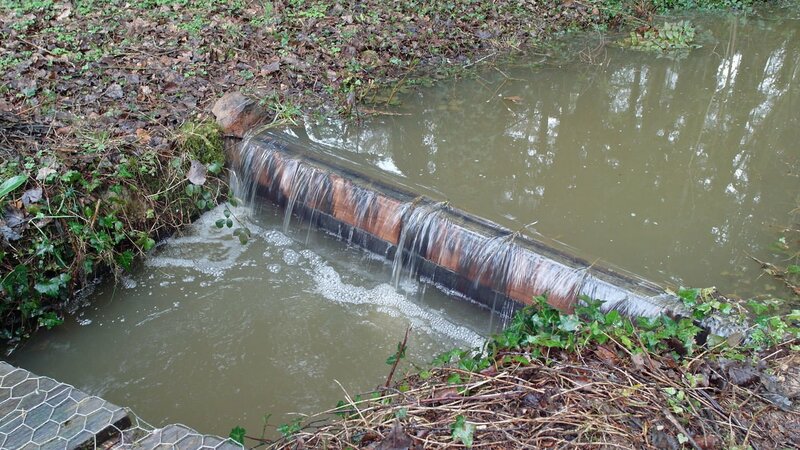 It’s very important when keeping fish in a basin not to over feed them as there is a higher risk of increasing ammonia levels which can lead to ulcers or even casualties. 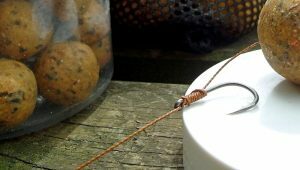 With the carp and cats removed and the pike and roach sold we could now leave the lake bottom exposed to the atmosphere. 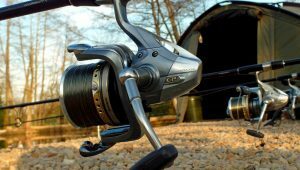 This is very beneficial to the health of a lake and a great opportunity for me as an angler to study all the nuisances of the contours of the lake. A few good frosts help to sterilise the lake bottom by killing off bacteria which are dangerous to carp. 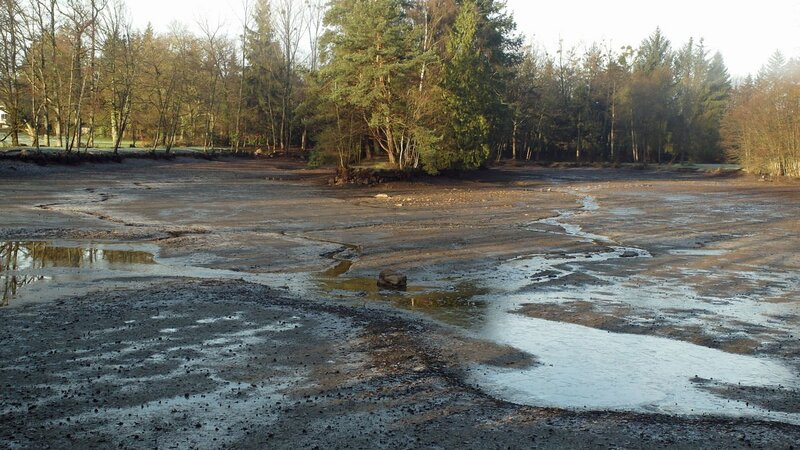 The lake was left to continue to dry out and drain for six weeks before we re-convened after the Christmas break. Before we could get the equipment required on-site, we had do a considerable amount of work to allow machine access. We had to build new driveways to the home swim and catfish corner swim that would be strong enough to support a 13 ton dumper truck, a 15 ton excavator and a 30 ton excavator. 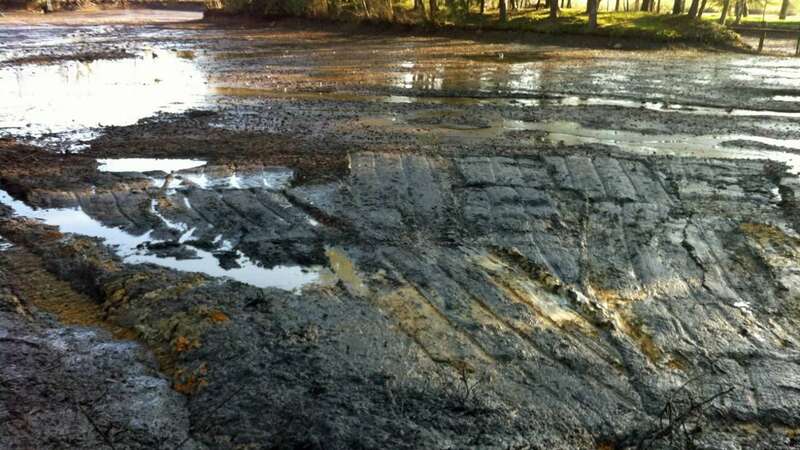 The driveway construction alone consumed hundreds of tons of 0-10 road base! I mentioned earlier that poplar trees are the fishery manager’s no.1 enemy. 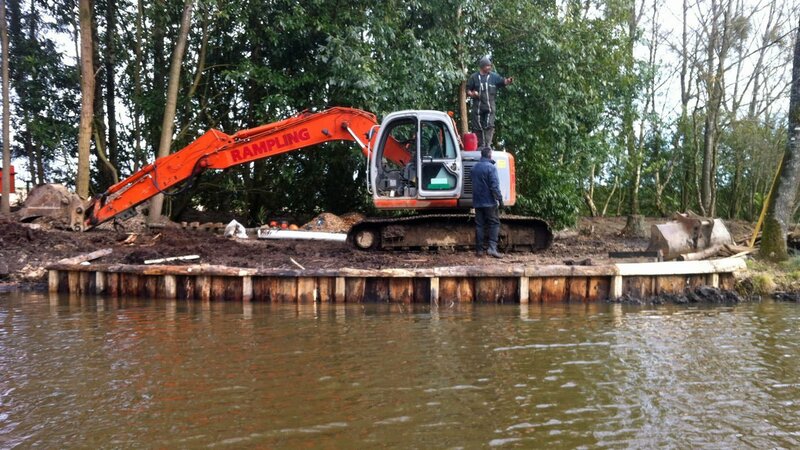 In order to enable the massive 18m long arm of the 30 ton excavator to swing where it needed, all the poplar trees on the dam wall and on the point swims had to be removed. Although felling trees on this scale is quite drastic, the lake will benefit from increased light levels and reduced leaf fall. 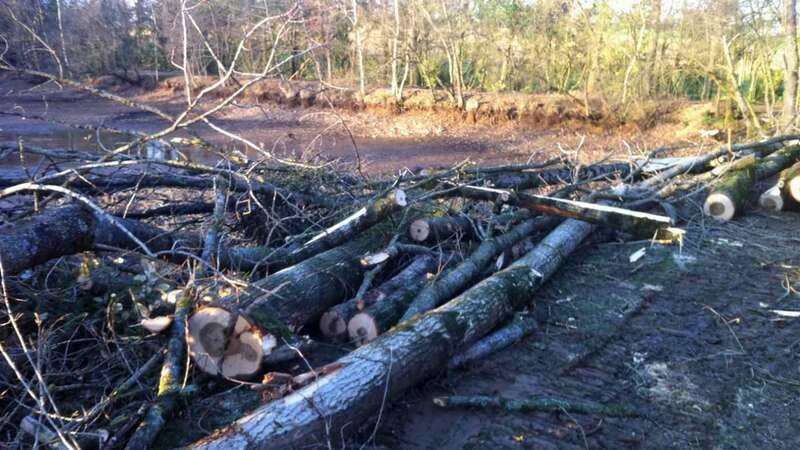 Felling poplar trees in confined spaces, next to lake margins is an expensive, messy and dangerous business. The work was brutal and seemingly endless but very necessary. We used the trees to create edging on the dam wall and to construct two more bunds behind it which would retain the silt that we removed from along the dam wall. With everything now in place it was time to get the massive JCB earning her keep. We started at the home swim and literally drove it into the lake as far as we could. 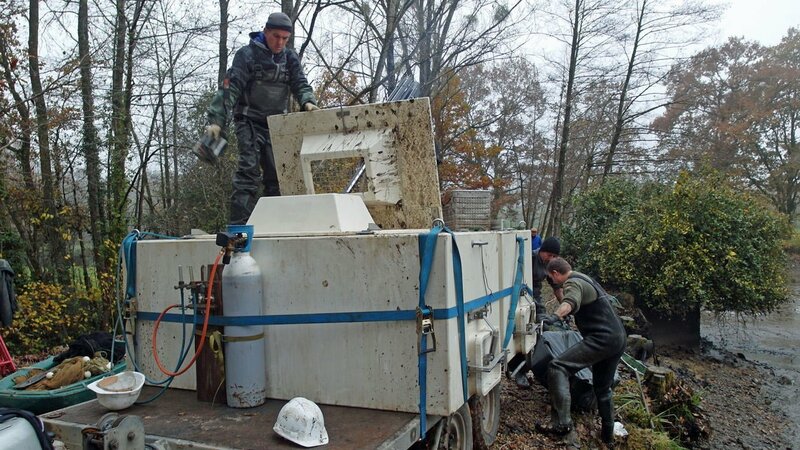 With an 18m reach and the ability to scoop out up to 1.5 tons of silt per scoop, this machine moves material at a phenomenal rate. 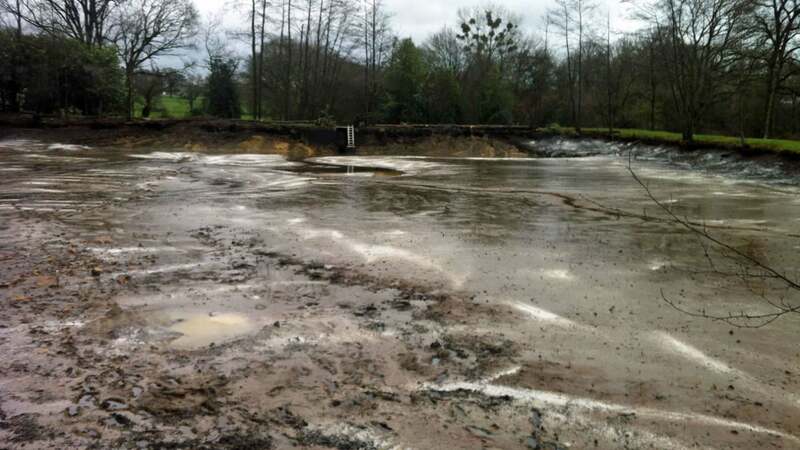 Vast swathes of silt were removed from in front of Home Swim, a brand new corner of the lake was created that didn’t exist before and massive quantities of silt were removed from around the aerator. We discovered we have a lot of blue clay here which is very rich in minerals and therefore of great benefit to the health of our carp. Depths around this area are now 3-4ft with some deeper holes to be found. 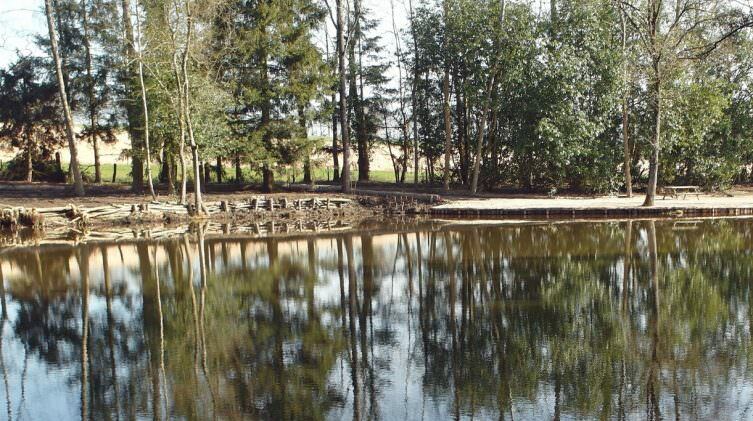 To finish this phase of the project we applied 600kg of powdered lime to the entire surface of the lake to sterilize it and accelerate the rate at which the remaining silt is reduced. 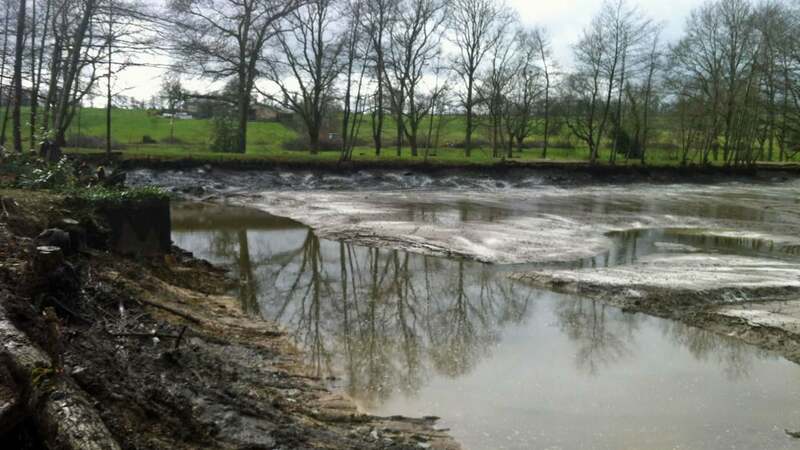 The annual treatment of the lake with lime will now form a part of our ongoing fishery management practice and we should see silt levels reduce steadily over the next 5 years. Undertaking this kind of work in the middle of winter is a messy business and the machines left a trail of destruction in their wake. Now it was time to repair all the damage done. We could have done a quick bodge it and scarper job here but anyone that knows us will know that just isn’t our style! Dave, our main contractor for this project, promised me he could make it look stunning within two weeks so we said great, go for it! The dam wall area was scraped flat and finished off with 90 ton of 0-10 and 30 ton of 12-20 washed shingle. 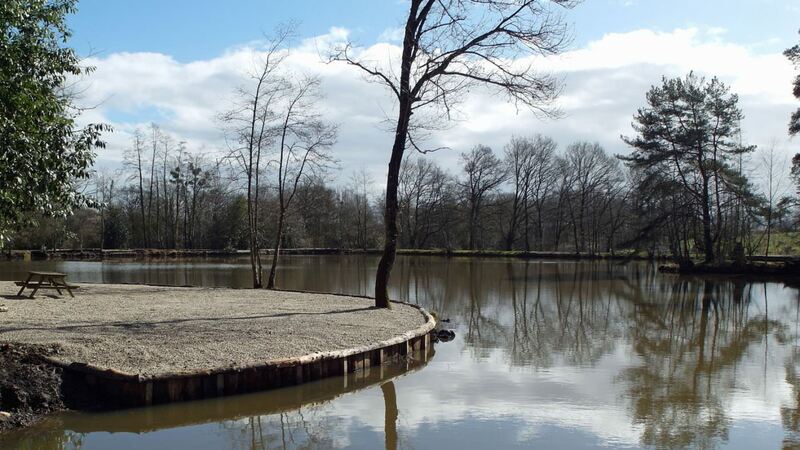 The old catfish landing platform was ripped out and replaced with a solid chestnut construction that is 3 times as big. The Point Swims looked like something from a war film with massive holes and mud everywhere! After seeing what could be achieved with the dam wall we no longer had any fear or doubts. We used a massive amount of chestnut boards and posts to completely rebuild the front of the point swims into one large majestic arc. Lots more rock and road base made a solid base for 30 ton of washed shingle. Then it was onto the Home Swim. The old swim was ripped out and replaced with a massive double swim and linked to the main driveway with a 40m long pathway. Again chestnut was used to construct the front. They oxygenate the water without consuming electricity 24hrs per day! As for most of the construction work done, chestnut was the wood of choice and at 60mm thick the boards should be good for very many years. Finally we were able to move the fish back from their temporary home and re-stock them into the lake. 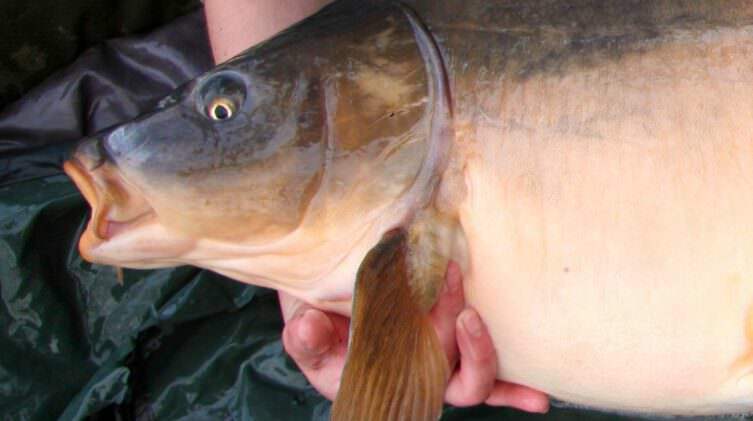 Each carp was weighed and anything over the 30lb mark was photographed for ID. We also returned twenty or so big cats! It was a massive relief to have them back and wish them all the best as they explore their re-landscaped environment. We hope that it will nourish and sustain them in good health for many years to come. 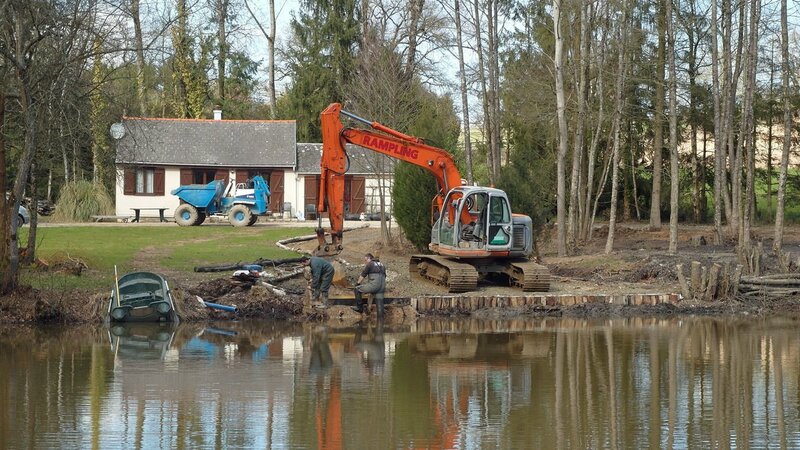 In order to balance the aquatic system we added back 140kg of roach and 5 small zander. 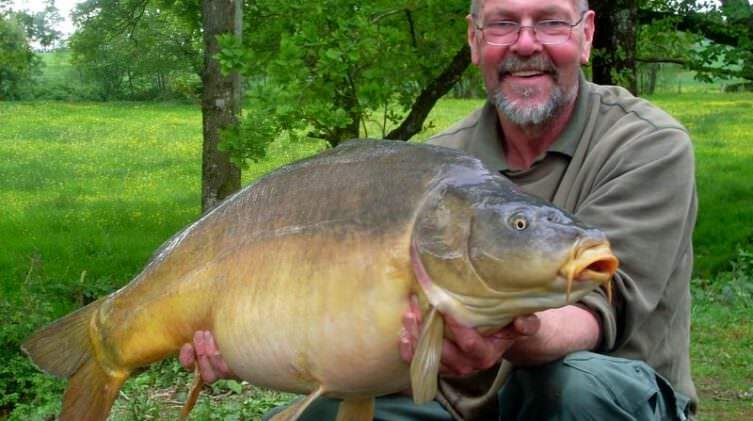 All credit for the project should go to David Midgely of Etang Marolles. He was the brains behind the entire project and what he doesn’t know about fishery management isn’t worth knowing! Thanks also to Jean Claude Gandon of Le Centre de Pisciculture et Pêche de Montjean. 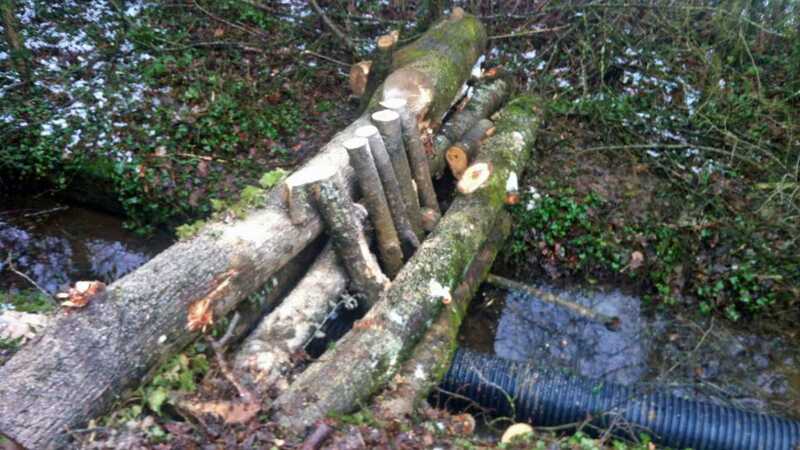 Many thanks also to Marc Fossey for his assistance during the project and to Alan Smith for his skills with a chainsaw. 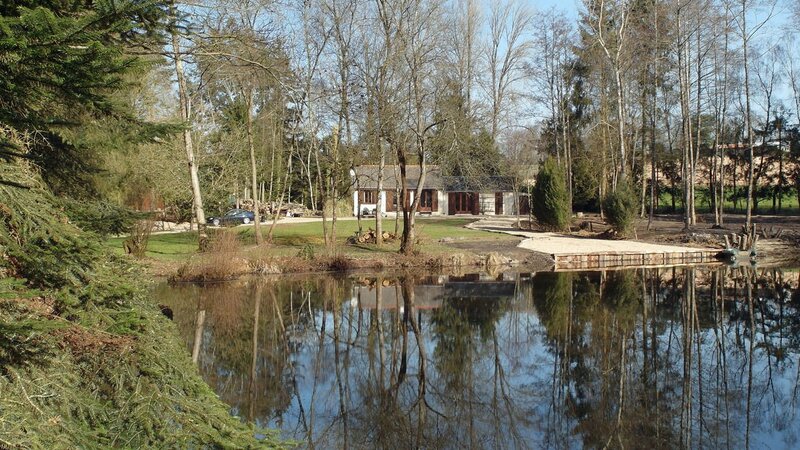 Fancy a fishing holiday at Beausoleil Carp and Cats? 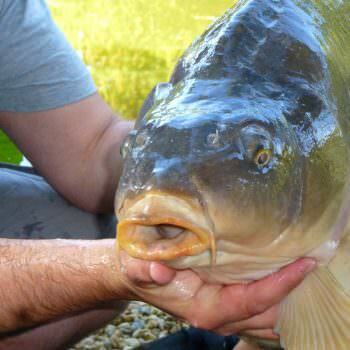 We offer an exclusive fishing holiday experience run by a passionate carp angler and experienced fishery manager. 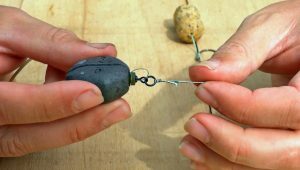 We will do our best to enable you to catch your dream fish.